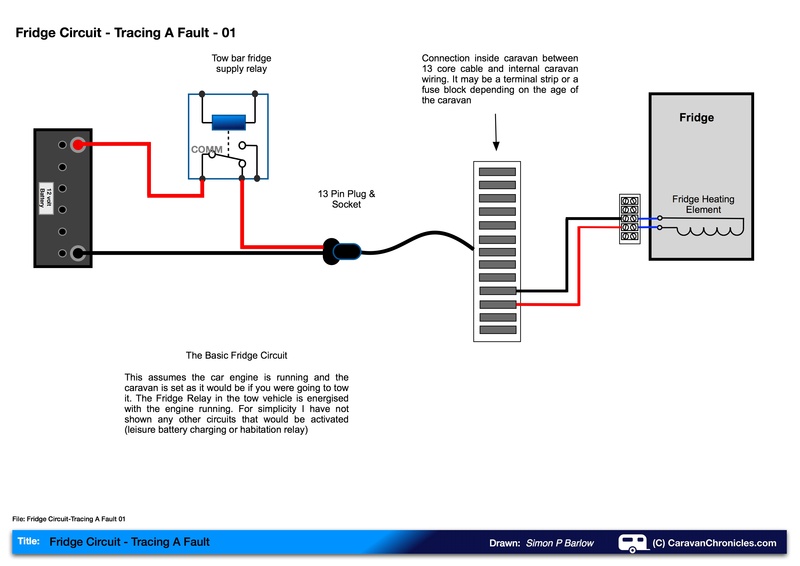 A frequent question that is e-mailed to Caravan Chronicles is how to fix a fridge circuit that doesn’t seem to be working correctly when towing. I’ll assume that you have checked the 12 volt heating element in the fridge and all other lights/indicators are showing that the fridge ‘should’ be working OK with no error messages. To check the heating element you will need to know what the rated wattage is and simply work out the resistance of the element and test with your multi-meter. If you don’t know how to work the resistance out from the wattage read: Understanding Watts, Amps, Volts and Ohms. Most of the other problems are due to issues with the electrical circuit and more often than not the earth (or return) for the circuit. One of the ‘quick fixes’ for earth problems with the 12N & 12S plugs is to link the three earth cables (road lights, leisure battery charging & fridge) together. However this is not recommended, no matter how tempting it is. Doing this might result in a melted tow plug and socket due to a faulty earth somewhere allowing all the return current for the road lights, leisure battery charging and fridge to return through one pin of the plug. The old 12N/12S were not rated to take this current and the connections often overheated. The modern 13 pin plug can take this current, however the damage is more likely to be a melted cable somewhere. It is critical that these three earth circuits are kept separate within the caravan and should only be connected together once inside the tow vehicle at a common earth point. The fridge circuit looks complicated but in fact it’s quite simple. 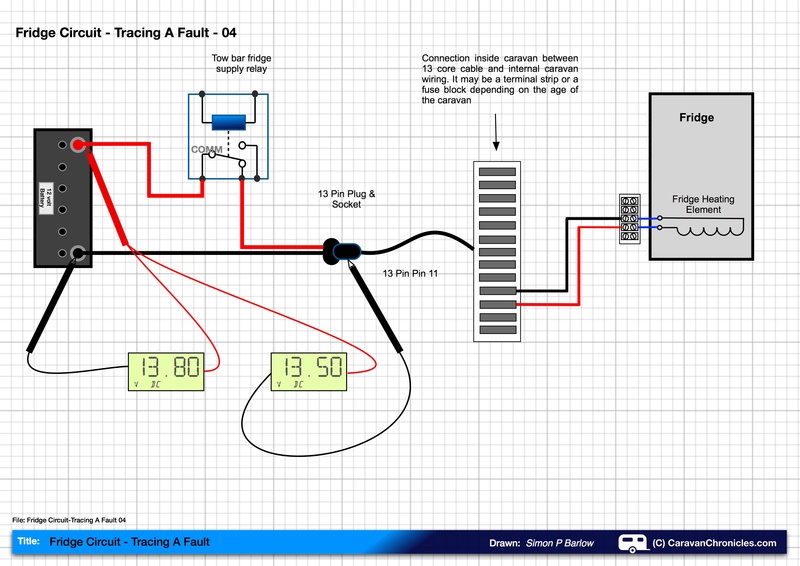 I’ve drawn out the basic circuit (below) and left out all the wiring that isn’t really involved in running the fridge. The earth connection between the battery and the 13 pin socket might be the vehicle body itself. I would always recommend running a 4mm or 6mm cable from the battery to the common earth point at the rear of the car for the tow electrics as well as using the vehicle chassis for an earth. Copper, after all, has a lower electrical resistance than steel and you are relying on steel sections welded together to provide an electrical path. To perform fault-finding on the fridge circuit you are going to need a couple of things. The first is a multi-meter set to read DC volts in a suitable range – 0 to 20 Volt range is fine. The second thing you will need is a long test lead – about 5 metres long, with a 4mm Banana plug on one end (to suit your multi-meter) and a crocodile clip on the other. A 5 metre length of 1.0 or 1.5 mm Sq single core flexible cable will be fine. You can usually buy a 5 metre spool of cable for a few pound from Maplin along with a 4mm banana plug and a crocodile clip. The reason you will need a long test lead is because we will be measuring the voltage all the way to the fridge at various points with one lead of the multi-meter attached to the tow vehicle battery. The other thing you will need to do is disassemble the 13 Pin plug (or 12S Plug) on your caravan (if you don’t know how to do this read The 13 Pin Plug Puzzle). You will need to plug the disassembled plug into the tow vehicle trailer socket so that you can measure the voltage on the relevant pins while the engine is running. OK, lets talk safety. The testing outlined here requires that you connect the caravan to your tow car, with the 13 pin (or 12S) plug partly disassembled and take voltage readings with the engine running. While you are taking readings at the rear of the tow vehicle you will be close to the exhaust with the engine running. If you are in any doubt about your abilities using a multi-meter or working on live circuits, please get a qualified auto electrician to do this for you. You will need to know where all the cable connections are, so there may be some element of dismantling part of the vehicle trim to access the fridge circuit relay in the vehicle and inside the caravan, you will need to locate where the cable(s) from the electrical towing connector (13 pin or 12S) enter the caravan and terminate in the fuse box/junction box. You will also need to be able to access the electrical connections on the fridge. Most of the information you will need on the locations of these items can be found in the relevant handbooks, which should also help you identify which cables and terminals to test. 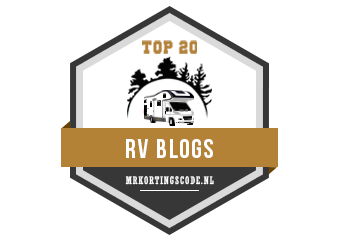 With access to everything sorted out and the vehicle connected to the caravan you have to use the long test lead and connect one end to the NEGATIVE terminal of the vehicle battery and the other end to the NEGATIVE (-VE) or COMMON terminal on your multi-meter. Double check it is set to read DC Volts at a suitable range (0v-20v or 0v-30v). You can now start the engine. It might take a few minutes for the fridge circuit to become live depending on the vehicle but if you leave it ticking over for ten minutes or so before you start it replaces some of the charge back into the starter battery so the battery voltage reading will not alter much. Make sure the caravan switches are all set to how you would have them if you were towing normally. Right, the first reading we want to take is the battery voltage – this will be our reference voltage. Using the POSITIVE lead of your multimeter on the battery +VE terminal take a reading. In the example below it is 13.8 volts. Write it down on a notepad. The next reading is the input side of the fridge relay – sometimes the relay is in the engine compartment, but more usually it can be found in the rear of the car. Read the voltage from the input terminal and then check the voltage from the output terminal. The last reading for the moment on the vehicle is now pin 10 on the 13 pin towing socket (pin 6 in the 12S). Take the reading from the pin on the plug while it is plugged into the socket so we not only check the connection in the socket but the connection between the socket and the plug. That’s why we had to disassemble the plug earlier. Make a note of the reading. We now have a few readings we can start to work out voltage drops with…..
Now we can work out the voltage drop for the +ve side of the circuit…. In this case its 1.3 volts. Next we need to check the voltages on the return (negative -ve) side of the circuit. For this we need to swap the leads round on the multi-meter. We need to connect our long lead from the battery +ve to the +ve connection on our multimeter and use the black test lead connected to the common or -ve on the multimeter as the test lead. 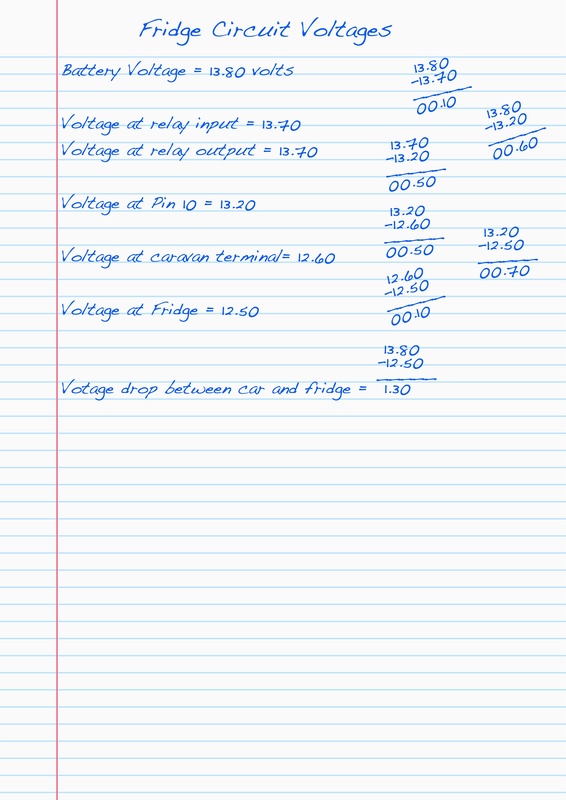 Looking at our notes we can start to quickly work out the voltage drop on the return path of the fridge circuit for the vehicle…. 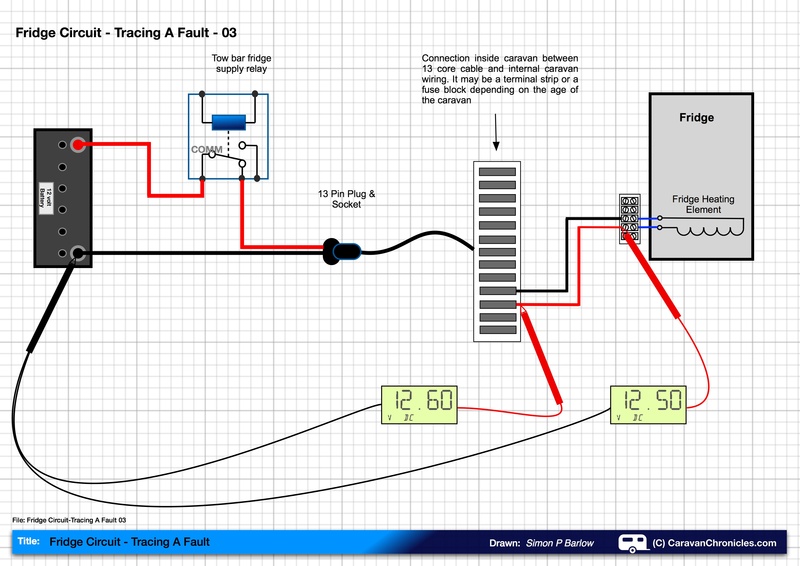 We should now have the last set of readings we need to work out the remainder of the circuit…. 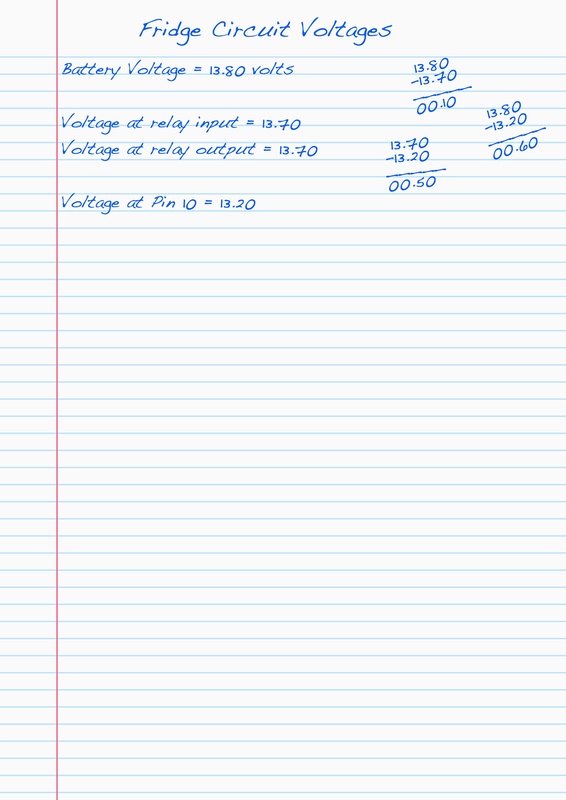 We can see that the voltage drop for the return circuit is also 1.3 volts, therefore for the fridge circuit is loosing 2.6 volts, so if the battery voltage is 13.8 volts the fridge is only getting 11.2 volts. We have to look for the biggest voltage drops in any one section. In our example nothing stands out too much although we do have a larger drop between the voltage at pin 11 on the return side of the circuit and the fridge which is 1 volt. So I’d check the connections at the fridge end, the fuse/junction box and in the 13 pin plug. If I get larger voltage drop between the battery and the 13 pin plug connection on either the +ve (live) or -ve (earth or return) then I would suspect that the connections on either the back of the 13 pin socket or in the 13 pin plug. If water gets in to either, then the copper cables oxidises and the resistance can increase. You can tell with a visual inspection – if the copper in the cable under the screw terminals doesn’t look ‘bright and shiny’ but dull and brown then it is worth remaking the connections by cutting off the end and stripping the cable back to bright copper. To protect from water use a proprietary aerosol water dispersant aerosol for electrical connections. DO NOT use WD40 as this can affect the plastic of the plug/socket long-term. Cleaning terminals is easy. You can use a 1200 grade emery paper to clean terminals so they are ‘bright’ and a switch cleaner aerosol to degrease them. With spade terminals, they can become loose. Careful use of small pliers to squeeze the curled part of the terminal can solve the problem. The earth terminal in the rear of the tow vehicle is a common cause of problems. Usually it’s a short threaded stud welded on the chassis with a nut to hold ring terminals down. As it’s in the boot, it can suffer from corrosion and that’s always worth cleaning up… especially if you think you road lights on the caravan are dim or the side lights flicker when you have your indicators on. 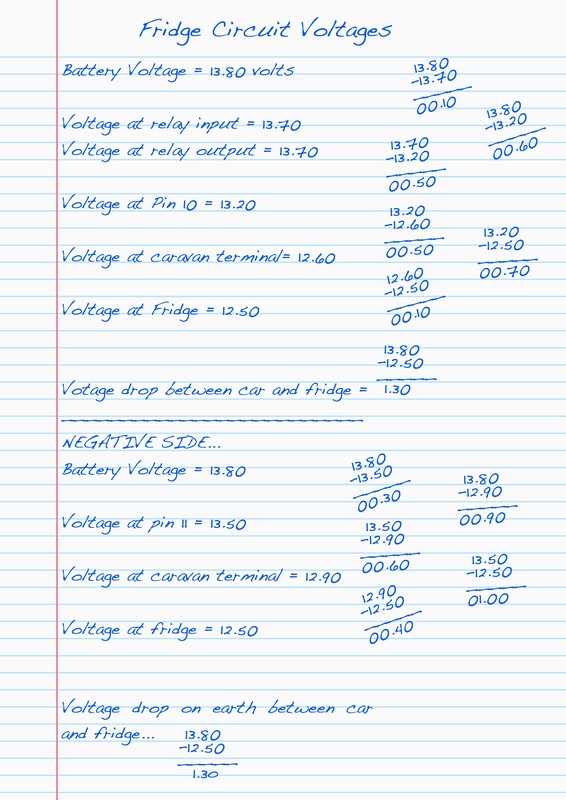 Ideally the voltage drop on the fridge circuit should be as low as possible. We have a Thetford N175 in our 2011 Lunar Delta TI. If you try and run the fridge on 12v we get a clicking noise coming from the lower vent of the fridge. This is with the car connected and the engine running but not revving. Car is a 2005 Jeep Grand Cherokee. It almost sounds as if the system is trying to light the gas burner. The dealer says that they have checked it out using some device and no issue, but cannot understand how this can be done. We have the 13 pin connector. We have been informed that even though the master switch is off, the fridge can still place a drain on the battery? The Thetford N175 fridge has SES – Smart Energy Selection, which basically means it will detect what energy sources are available and select them to keep running. So if it detects 240 volts when you are on EHU, then that is the first choice. If you can hear clicking, that sounds like the ignition circuit for the gas burner trying to ignite the gas. The fridge hasn’t detected 240 volts or 12 volts from the tow vehicle so it will try to keep running on gas. The repeated clicking is obviously due to the gas being turned off for towing. In order for the SES to work, the fridge will need a supply from the leisure battery in the caravan, however, I would not have thought that with the caravan master switch ‘off’ the fridge could drain the battery. On our caravan (Swift) the master switch needs to be ‘on’ when towing for the fridge to work. If the fridge is trying to operate on gas while the tow car is connected, with the engine running, I’d check to see if the fridge is getting the 12 volts feed from the tow car first as it sounds like it may not be. Check the fuse in the tow car, this is a big fridge and I think the 12 volt heating element is 190 watts, so it will require 15 to 16 amps, some fridge circuits on tow vehicles are fused at 15 amps not 20 amps. Next, I’d check that you have 12 volts on pin 10 of the 13 pin socket on the back of the tow vehicle. Use pin 11 (fridge earth) as the earth to check against. If that checks out OK, you will need to check to see if there is a fuse for that circuit in the caravan and confirm that fuse is OK if there is one. From there, it’s a matter of checking that the 12 volts from the tow vehicle is reaching the fridge. I don’t have a manual for this model of fridge but it might be worth checking to see if you can turn off SES and manually select the energy source. If you can and selecting 12 volt works, then the Energy Management Power Board might be suspect… hopefully not as it’s about £140 to replace. It might help finding your problem. 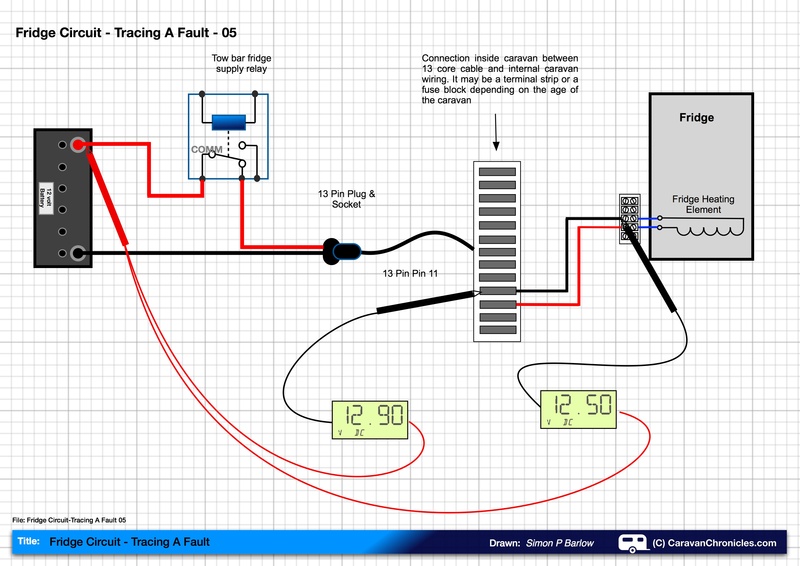 You don’t say which fridge or which relay is clicking or if it’s when connected to the tow vehicle with the engine running, but m first action would be to check the earth return path from the fridge back to the tow vehicle then check the actual voltage reaching the fridge. It sounds like the voltage is too low and the fridge cuts out. I have an Eriba caravan with the BIP control unit type model 30.65100.84, with integrated charging circuitry and booster, and a Dometic 3-way fridge. I rarely use the fridge while towing, preferring to keep weight down with chilled food in a coolbag in the car, so I don’t usually switch on the red, 12v switch on the fridge. On site, I run the fridge on gas. However, a while back I discovered that the BIP unit was overheating when connected to an EHU on site, and one of the 15amp fuses had blown (the main fuse to/from the leisure battery). Since then I’ve been trying to trouble-shoot the wiring, and I’ve noticed that, while connected via 13-pin plug to the tow-car and with the engine running, when I turn on the red, 12v switch on the fridge its light goes on and off. At the same time the fridge relay (which is housed in the BIP) clicks at the same rate as the switch, about 2 cycles/second. I’ve tested the continuity of the 13 cores as they are connected to tab connectors beneath the caravan floor, and everything checks out as far as I can go. I’m pretty sure it’s an earthing fault from the relay, but before I take anything else to bits, does any of this ring a bell with you? Sorry for the delay in replying, I don’t know the BIP system in the Eriba caravans, but I would tend to suspect the relay cycling on the fridge is due to the low voltage cut out. Normal operation the fridge turns on and if the voltage drops too low the fridge will turn off. If the voltage rises again, the fridge will turn on. When there is a voltage drop on the supply or earth cable, as soon as the fridge load is applied the voltage drops below the lo-volt limit and the fridge switches off… and the voltage rises again as the load has been removed, switching the fridge back on. I would start be checking the continuity of the fridge supply circuit and then the continuity of the earth path back to the tow vehicle. If the BIP unit has overhead and blown a fuse, then it is worth checking to make sure all the cables connected to it are OK as if there has been an overload, some might be heat damaged. I would tend to suspect the earth path for the 12 volt systems has a fault and personally I’d start with that. No need to apologise, and thank you for replying. In the meantime I’ve moved on a couple of steps. First off, I’ve replaced the 13-pin plug and cable. The existing one was giving all sorts of lighting problems, and in addition the thread in the body of the plug had seized meaning I couldn’t open it up for inspection. When I finally broke it apart I found it was wet inside, and there was a lot of corrosion and perished insulation – much as you’ve described elsewhere. Anyway, having replaced it, the road lights etc. now all work as intended, and although the BIP gets a bit warm there was no overheating after 3 hours of 240v AC input. However, with _my_ towcar, a 2004 Honda CRV, that relay is still cycling whether the 12v fridge is switched on or off; but, when I plug into a more modern vehicle (engine on), the relay works and the fridge begins to cool. This suggests to me that the earth path problem is within the Honda, not the caravan. I should say that all of this has arisen since we changed the car about two months ago, at which point we had to have the electrics upgraded from a 7-pin to a 13-pin. I believe this version of the CRV has a dedicated outlet for 7-pin cables behind the nearside rear trim panel (and no CANBUS) but that new wiring for a VSR etc. needs to be patched in. I suspect this wasn’t done properly. I had used a local mobile towbar engineer who I’d used before, but needless to say I won’t be asking him to put it right this time. I wish I was qualified to do the necessary myself, but I’m afraid it would be beyond me. Once again, thanks for replying, and for maintaining such a splendid resource. It might be worth checking where the earth cables from the 13 pin socket are earthed within the vehicle. There should be three of them – road light earth, fridge earth, leisure battery charging earth. These need a good clean connection with the vehicle earth and sometimes if it is behind trim in the boot area it can corrode. The other thing to check is that the two supply circuits, one for the fridge and one for the lea sure battery are separate in the vehicle, I know of some installers to save time and money have run just one cable and split it. The last thing to check is that the output for the fridge on your 13 pin socket actually comes live when the engine has started. Some Honda’s have an eco system that reduce the voltage on the field coil of the alternator when the vehicle battery is charged to reduce load on the engine… saving money. This usual has to be disabled in the vehicle software so that when a trailer plug is detected it turn the system off. Check with your local Honda dealer. PS I should probably better call it the habitation relay. Thanks again for your very helpful pointers. It turns out that the caravan’s power was being taken from the rear windscreen wiper motor to the new socket. So the relay was sensing a voltage, switching on, finding the voltage was insufficient, and then switching off – and so on. I laid a new fused power feed directly from the battery, and now the relay and the red switch work as they should. Since then I have monitored the BIP’s temperature while connected to EHU. Although it still gets warm, it is now no warmer than I would expect from a transformer. I had a tow bar with electrics fitted to a 2011 LR Freelander 2. There are no volts (0V) at the fridge connection with or without the engine running. I believe that it is not LR specific wiring. 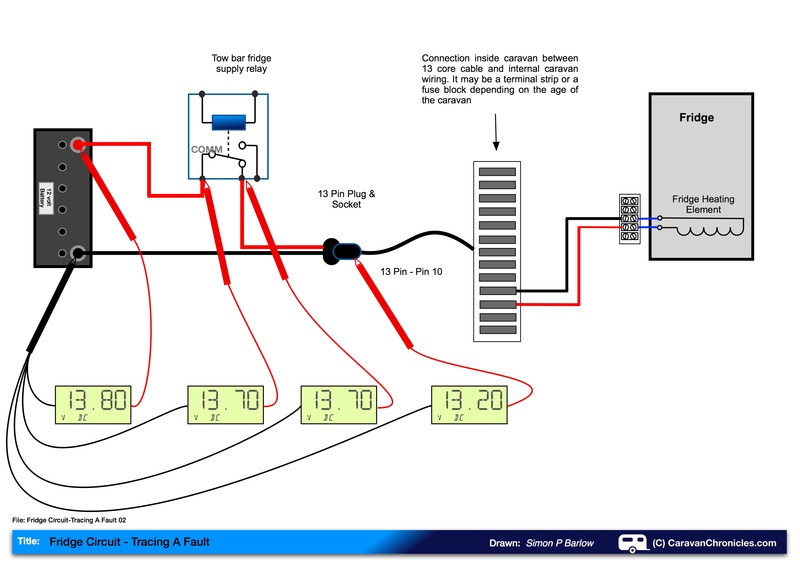 The installer said that it is correct to have no volts but that the relay detects a load and turns on the connection so a simple test meter will not have a load and therefore will not trigger the relay. I have tested by running a portable fridge cable to an old 13 pin plug. It doesn’t run so I think his explanation is incorrect. I saw him make the connections to the relay, test 3 terminals and get lights for each on his tester and then adjust something on the relay (a potentiometer I think) so that only one of the lights lit up. He said that the potentiometer was specifically to enable testing after installation and then should be adjusted to turn off the connection as described. I think he might be talking rubbish. I am about to give up and get another installer but I think that will cost a lot of money so I am reluctant to do that unless necessary. The Freelander 2 needs an OEM electrical kit and the vehicle ECU needs a software update to enable the towing package so it can adjust the ABS brake system and stability control as well as turning off the rear fog lights when a trailer is connected. The Freelander 2 with the OEM wiring kit and software update does not activate the fridge charging circuit until the engine start battery is back up to a fully charged state, so it might take 10 or 20 minutes, depending on the state of charge of the vehicle battery before the fridge circuit is turned on. To your problem… it sounds like they have fitted a variable VSR…. voltage sensing relay if they are adjusting something, which is not a Land Rover specific wiring kit but a generic one. Unless they have updated the software as the vehicle battery reaches near full charge, the engines ECU reduces alternator output to save fuel and it might not reach the preset turn on voltage of the VSR to turn on your caravan fridge and leisure battery charging. I would check back with the installer and ask if they have installed an LR OEM kit and have done the software update. Many thanks for such a fast and detailed reply. I will go back to the installer but it is not OEM and the ecu was not updated by him (but I suppose that it might have been by the previous owner). What is the practical effect of it not being OEM? I am aware of the fridge problem and I have to disable the parking sensors when selecting reverse but everything else works OK.
I’ve never seen the installation of a non OEM kit on a Freelander 2 so it is down to where it connects to and how it is fitted really. The key one is the software update and if it has been installed. Apart from the fridge circuit not working this will also mean that your leisure battery is not being charged (the habitation relay will not activate) With regard to the vehicle if it has not had the software update – the ABS system will not take into account you are towing and therefore function correctly, the vehicle’s Electronic Stability Control system will not function correctly neither will HDC. If it is an automatic, I think (but not sure) that the gearbox shift points may be changed too. Usually the gearbox is told to change gear at a higher RPM when towing to reduce strain on the torque converter at low RPM with a high load. The more obvious ones are things like the rear fog lights, reversing lights and parking sensors being disabled when a trailer is connected. Just as an afterthought…. they have added the relay and 15 amp fuse in the rear fuse box next to the spare wheel? Might be worth having a read through the install instructions for the Freelander 2 to see if I have missed anything out. Hi Simon, we have 30008 Peugoet and a 2007 sterling caravan. 12 months ago our N112 thetford fridge was replaced due to a gas leek. we had a new thetford 3000 fridge fitted and it has not worked since on 12v. 24ov and gas are fine. The fridge fitter is blaming the car and the tow bar people are saying its the fridge. The installer has changed the 12v element and it is still the same. we are getting 13.6V at the car plug and to rear fridge. all earths look good but reading your write up is it worth putting from the neg side of the battery to the bank of earths to rear of the car?. It is worth checking the voltage at the rear of the car with the circuit under load… use a 50 watt halogen bulb and check the voltage. It might be a high resistance connection… voltage showed OK open circuit, but drops under load. However, that said if it was working before I’d tend to focus on the circuits with the caravan. There are 2 connections for the 12 volt heating element. If you have a good voltage reading on the +ve side of the element, then check the neutral (-ve) path. The caravan fridge -ve is pin 11 on a 13 pin plug and should not be connected to any other -ve connection in the caravan only to a good earth point within the vehicle. If you can find this point and disconnect it from the vehicle ground and check the voltage between the fridge ground (-ve) and earth (with the caravan connected and engine running of course) you should get a reading. If you don’t then the problem is between the fridge and vehicle grounding point. The other quick test that I’d do is with everything hooked up and engine running, I use a length of cable from the vehicle +ve terminal to the fridge +ve terminal and see if the fridge worked. If it did then it is on the supply side. You can repeat this with the same lentght of cable from the -ve side of the vehicle battery to the -ve terminal of the fridge to see if the -ve (ground, neutral etc) is the problem. If you check out the wishing diagram for the fridge, from memory there are two 12 volt +ve terminals and two -ve terminals. One +ve and -ve is for the fridge light, gas valve and display…. the other is for the 12 volt heating element. Make sure these are not split… or the wrong way… i.e permeant 12 volt to the element and car circuit to the fridge. I have seen this happen on a fridge replacement. Don’t ‘common’ grounds(-ve) within the caravan, this can lead to other issues. We have changed vehicles and had a towbar fitted to a 2013 Shogun. Unfortunately I forgot to check the 12v when we used the caravan last weekend and the next time we use it will be when we go to France. Hope there is not an issue as I don’t think they used the dedicated electrics but rather an universal kit. If you are able to, I’d go and check everything is working before you go. Having received many emails from people that have issues when abroad, the big stress seems to be knowing that they have to live with it until they get back to the UK and it can be sorted out. Thank you simon will check this weekend. I know that on the rear of car, the earths are just to the body. I will first check these and a possible chassis point and will also run a wire from the battery – to the same position. I will be running direct from the battery + to the relay and then carry out the checks. the tow bar fitter has picked up a feed from the back of the car and im concerned that with the load of the fridge and the charging side its breaking down and loosing amps. I have downloaded the installation manual for the fridge and also the wiring diagram for the caravan. Just thought give you an update. earthed correctly, earthed fridge and now working on 12 and also charging battery. Glad you got it sorted… cold drinks on arrival now!